Hello guys, Here we are back with a loot deal from BookMyOffer. 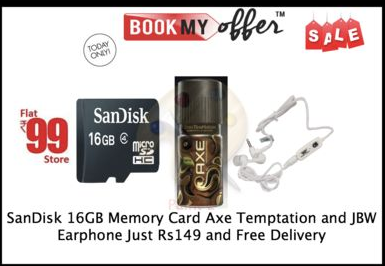 You will get a Axe Dark Temptation Deo Spray of 150ml, JBW Earphone and Sandisk 16GB Micro SD Card for just Rs99. You also get free cash on delivery. This offer is brought to you by BookMyOffer Mensingle Day Deal. Hurry! Grab it before it runs out. products for women,men,kids,home,electronics,books and other,to buy just create an account and add a product to your cart and complete your purchase. You will see an image of the offer with a small description. Click on the image. On the next page, either sign up on BookMyOffer or sign in. You can also choose guest checkout for faster checkout without needing to sign in. On the next page, enter your details and address and finally book the item for you. You don’t need to pay upfront as the payment is cash on delivery. You will receive an email confirmation. That’s it. You have successfully brought these 3 items for just Rs99. A big online shopping deal with ordervenue, this fulfill the all need of online user.